Before I began research on my immigrant novella, Journey to Freedom, I had no idea about the lengthy history of Ellis Island and the Statue of Liberty. While researching the statue, I came across data about the island and wondered how many others know the actual story without learning about it during research. That’s when I decided to follow up my Statue of Liberty piece with the story behind Ellis Island. Back in the days before we became a nation, the west shore of the upper bay of New York consisted mainly of tidal flats and oyster banks on which the Lenape Indians relied for their major source of food. Several of the islands remained above water at high tide and became known in later years as Liberty Island, Black Tom Island, and Ellis Island. They were named the Oyster Islands by early settlers of the first European colony in the region. Through the course of years, the railroad eventually killed off the oyster beds, engulfed one island and changed the shoreline of others. One of the islands left became known as Gibbit Island and is where some pirates were hung from one of the islands trees. Around the time of the American Revolution, it was acquired by one Samuel Ellis and in 1785, he tried to sell the island without much success. In 1794, the state of New York leased the island and began to shore it and fortify in 1795 because too many English warships were able to come into the harbor during the war. No pictures of these early islands could be found. It was ceded to the United States in 1808. The War Department then established a fourteen gun battery, a mortar battery, magazine and barracks. From 1808 until 1814 it was a federal arsenal and was named Fort Gibson after Colonel James Gibson who was killed during the 1812 war. It remained a military post for almost 80 years before the government turned it into a federal immigration station. A wooden building was built to process the immigrants in 1892, but in 1897 that building burned. Many records were then lost. A new brick and stone building was then erected and is still there today. and 1914. 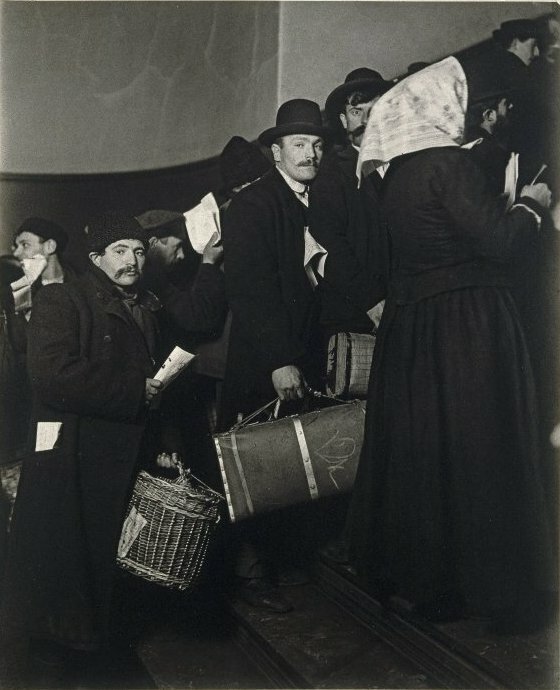 Officials interviewed around 5,000 immigrants per day. In 1907, 1,004,756 immigrants were processed through immigration services on the island. About 30 to 40% of Americans today can trace their ancestry to immigrants arriving on the island. In this picture they are crossing over the bridge with all their belongings. If they were in good health and their papers were in order, immigrants spent anywhere from two to five hours in interviews and health inspections before being allowed in. Officials asked twenty-nine questions including name, occupation, and how much money they carried. to their home country or held in the hospital facilities on the island. Some of those men and women, perhaps as many as 3,000, died on the island. About 2% were rejected for other reasons such as poverty, criminal background, or insanity. The island became known as “The Island of Tears” because of the rejections. The Kissing Post stands outside the Registry Room. So called because it’s the spot where relatives and friends greeted the new arrivals with hugs and kisses. 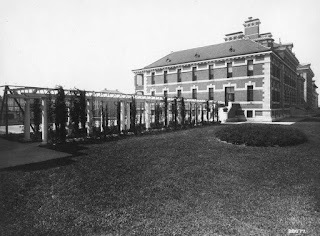 The hospital erected on the island to take care of those who were sick. 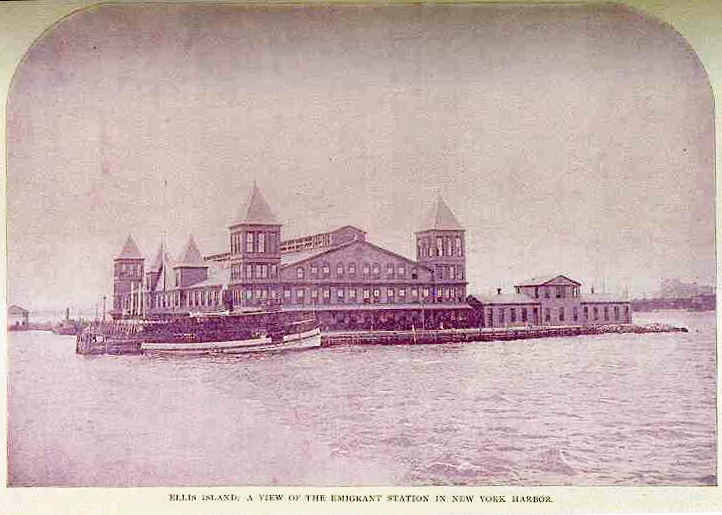 Ellis Island as it looked in 1905. 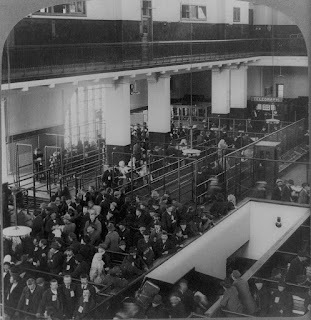 With the passing of the Immigrant Quota Act of 1921, the number of immigrants allowed to stay declined. After 1924, Ellis Island became a detention center and deportation processing station. During WW11, it was used to hold Axis nationals detained as possible spies. During that time, it also processed returning sick or injured soldiers. After the war, immigration once again rose. In 1965, President Lyndon Johnson declared the island to be a part of the Statue of Liberty National Monument. The public had access to the island on a limited basis from 1976 until 1984 when it underwent a major restoration. The project was completed in 1990 and the museum opened. Immigration. Approximately 2 million tourists visit the museum annually. I’m giving away a Kindle copy of a new collection in which my novella, Freedom’s Journey appears. 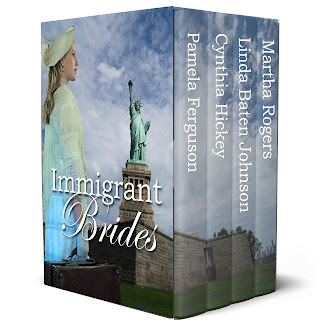 Four romances of immigrant women finding love in America. 1. When did your ancestors come to America. 2. Did they come through Ellis Island? 3. From what country did they come? After her grandmother’s death in England, Rosemary Beckett is left with only a house and no means of support. 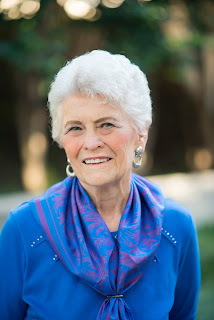 An old friend of her deceased father offers her a position in America as governess to his grandchildren. He pays her passage, and Rosemary embarks on the journey. When they enter the New York Harbor, she meets a charming young man who catches her interest, but because he’s a first class passenger, she flees and leaves the ship without revealing her identity. Alexander Cartwright is fascinated by the young woman he met, but with no idea who she is, he only dreams of finding her again. When he discovers she’s the new governess to his brother’s children, he believes it’s God’s answer to his prayers and seeks to know her better. Rosemary locks her heart and determines not to be influenced by the handsome Alex. He determines to break the lock and set her heart free, but will he succeed? Enjoyed this post. My great-great- grandmother came through New Orleans not Ellis Island. I was surprised to learn there was more than one entrance point. Yes, I also found that very interesting. Seems some Asian people came by way of California. I guess that explains why there were so many Chinese people in the west and few in the east where the Europeans lived. Amazing how we don't think about those things until we begin research. Thanks for stopping by. What is your email? I enjoyed this post, Martha. My mother-in-law's family came from Belgium, although I don't know if they were processed through Ellis Island. My great-great grandmother on my mom's side came over from Scotland, although they went through New Orleans like Cindy's family. I was also surprised to learn that New Orleans was a place where immigrants arrived. The Ellis Island building is beautiful. I'd love to visit it one day if I ever get back to the New York area. As I was doing research, it was fascinating to learn about the immigrants and how and where they entered the US. Thousands of people wanting to come to our country every day was mind-boggling. My family came from France into Canada. I think in the 1780s? My great grandfather's family came to Iowa in the 1800's from Canada. Very interesting post Martha, thank you for sharing. I enjoyed the pictures. 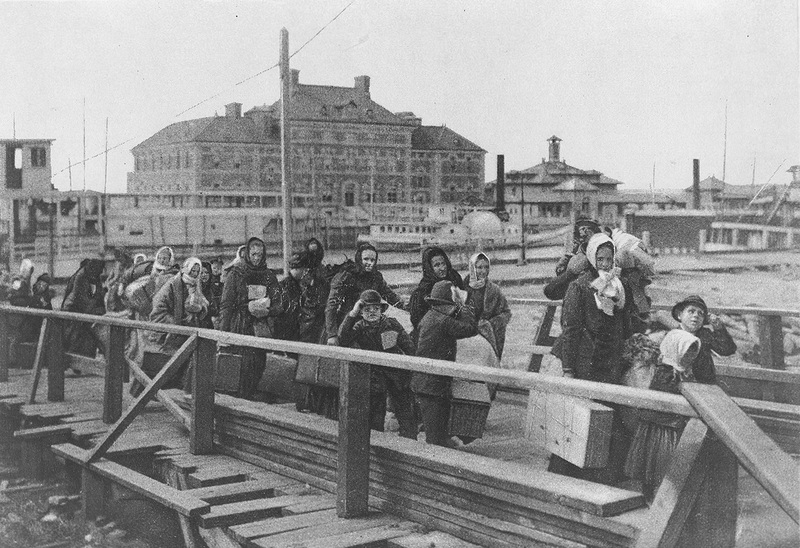 I would like to visit Ellis Island one day. I have done a bit of family genealogy & as far as I can tell my great-great(x's? )-grandparents (dad's) probably came through Ellis Island, traveling through Pennsylvania, Maryland (where I now live, since I was 5yrs) & on into Virginia (where I was born). I was surprised, as I thought they always lived in Virginia & had not thought about them coming through immigration prior to my research. I understand what you mean. I had no idea my great-grandparents came from anywhere else. I thought they'd always been Texans. My great-great-grandfather came from Germany and he also went through Pennsylvania and then on down to Mississippi and Louisiana. Amazing what research turns up. Thanks for stopping by. Thanks for stopping by, Connie. I was amazed at how many people were processed on a daily basis. Thank you for stopping by, Alison. Yes, it would take a lot of courage to leave your homeland and come to a new world with a different language and way of life. I'm thankful my great-great-grandparents did. I'd love to visit Ellis Island some day, Martha. 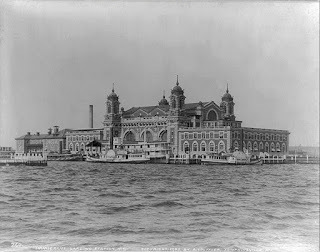 My husband's maternal grandfather came to the US through Ellis Island from London at the age of 16. His paternal great-grandfather came from Norway. My dad's ancestor helped found Hingham, MA (Boston area) in 1630, and my mom's family came to America in the 1700s, so her Cherokee family probably greeted them. lol Family history is fascinating, isn't it? Oh yes, Barbara, it's truly fascinating. I was surprised when I learned both of my parents' ancestors came here from Germany. Paternal great-grandfather (Weissermann) came in the early 1800's and maternal great-grandfather (Mueller) came in the mid-1800's. Had no idea about that until I got involved in genealogy. Thanks for dropping in. I believe my ancestors came from Ireland. I sure would love to win this book. And if I don't I'll purchase it. Thanks. Congratulations! 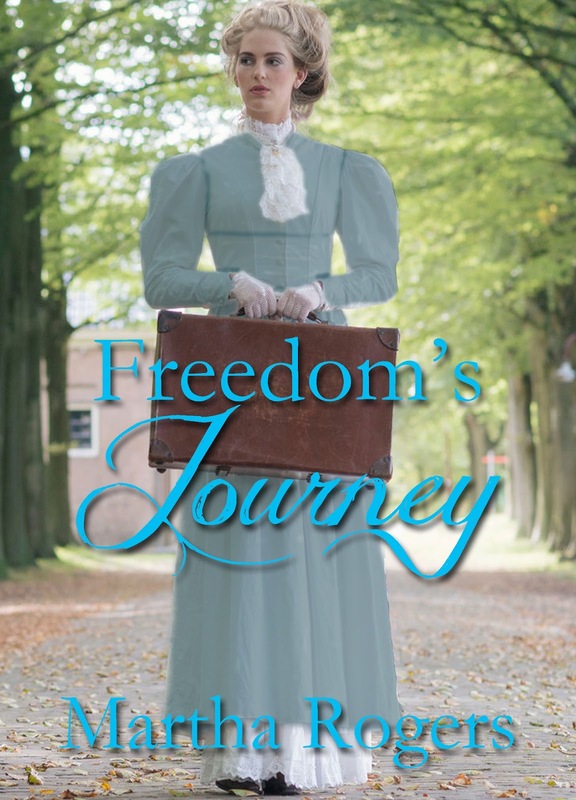 Rhonda Gothier is the winner of the book Freedom's Journey. Thanks everyone for stopping by.